The 80/20 Rule is a popular phrase for dietitians, alongside “everything in moderation” and “fill half your plate with vegetables”. The idea is that you want to eat healthy 80% of the time, and allow yourself to eat less healthy 20% of the time. I have used the 80/20 Rule for years, and in a culture that can be very “black and white” or “all or nothing” when it comes to food and nutrition, the spirit of and intention behind the 80/20 Rule is a good one: you don’t have to be perfect in order to be healthy. In fact, it is often the pursuit of perfection that leads to an obsession with numbers, distorted body image and disordered eating. So, what is my problem with this seemingly sensible statement? People like numbers and structure, so the 80/20 Rule is catchier than simply saying “You don’t have to be perfect in order to be healthy.” Problems arise, however, when people start taking the 80/20 Rule literally. At best, the 80/20 Rule can be interpreted as choosing nutrient-dense, minimally processed foods 80% of the time, and less nutritious, convenience foods 20% of the time. At worst, the 80/20 Rule is just reinforcing the diet-binge cycle – you white-knuckle through a miserable, tasteless and restrictive diet 80% of the time, only to binge on “cheat meals” or a “cheat day” as the 20%, then rinse and repeat. At the end of the day, categorizing foods as “good” or “bad” is not healthy or sustainable. First of all, no one seems to be able to agree on what’s “good” or “bad” – I mean, is barley good? It’s a whole grain, but is it bad because it’s not gluten-free or Paleo-friendly? Even when you’re allowing yourself “bad” foods, there’s a lot of fear/guilt/panic around this “20%” idea, and you’re secretly/openly hoping that you keep those “bad” foods as far away from being 20% of your diet as possible. It may be more helpful to remember that all eating serves a purpose. While our diet culture upholds eating for nourishment/fuel only, who’s to say that eating for enjoyment, comfort or just to feel good is not as worthy? You might be thinking, wait, what? But I’m not the expert… aren’t you the expert? As a dietitian, I might be the expert when it comes to evidence-based nutrition, for example, what the evidence is saying and where to find credible information, but you are the expert of you and your body. The science of nutrition can help us explain why certain foods/eating patterns might make us feel a certain way, or what works/doesn’t work for people in a controlled environment, but true health comes from taking that information and figuring out how it applies to your individual needs. Our diet culture breaks the innate trust we have in our bodies and inner wisdom by teaching us that we need an expert to tell us what, how much and when to eat, whether that “expert” is a friend, family member, health professional, or even a meal plan ripped out of a magazine. Even though the 80/20 Rule may seem benign, it’s still essentially saying that we “should” or “need” to be eating a certain way, even though that may not be what your body wants or needs. So, What/How Much Should I Eat? The short answer is, the types and amounts of food that make you feel good. Of course, it’s easier said than done. Particularly for those people who have dieted for most of their life, and/or struggle with their weight and relationship with food, you may feel like you’ve lost your ability to listen to your body, let alone trust what it has to say. The problem with blindly following a bunch of food rules is two-fold: 1) they might not work for you, leading to more frustration; 2) when someone else tells you to do something, you’re less likely to want to do it. Instead, I invite you to just experiment with listening to your body – even if it’s just for a day. What are you really asking for when you are hungry? What does that feel like? What happens if you don’t/can’t feed yourself exactly what you want? What does fullness feel like? How do different types and amounts of foods affect feeling full or satisfied? How do you feel between meals and snacks? Curious about what else your body might have to say? Book a free 20-minute Appetizer Call with me, and let’s talk about it. Your posts are getting better and better Vincci. Good points, as always. You are too kind, Cheryl. Thank you! Love this article! Number 2 is exactly what I did. If I used the 80/20 rule I was trying to figure out how many days in a month I can binge. I am still learning how to be an intuitive eater but I feel so much better about my relationship with food! Thanks for your comment, Danna, and thank you for sharing your experience. I’m so grateful to hear that my article resonated with you. I don’t think I totally get the intuitive eating movement. I like the 80%/20% (rule/principle) as it helps to remind me that there should be some balance. I don’t see it as good vs. bad but nutrient dense/filling/whole/non processed vs. items that have different characteristics. Sometimes, the pendulum can swing too much in the other direction about not labeling and being free. For someone that likes structure, I don’t see anything wrong in having guidelines. I’m so grateful to hear that you see the intention behind the 80/20 Rule and that it reminds you to have balance. I hear ya – I think we are both people who have always had a naturally good, or at least neutral, relationship with food and with our bodies, so sometimes what’s considered triggering or potentially harmful in the intuitive eating or the body positive movement can seem a little excessive. It’s only when I’ve become more immersed in the movement that I’ve realized that it’s actually rare for people to view nutrition information, calories or weight as neutral numbers, instead of attaching some sort of moral value to it. I think that even though everyone can benefit from intuitive eating and body positivity, at its core, it’s really meant to serve the people who have a really disordered relationship with food and their body; who’ve internalized this idea that they’re “wrong” for eating a certain way, looking a certain way and/or being a certain way, when at the end of the day, when we look at the evidence, we haven’t figured out a single “right” or “wrong” way to eat, and sometimes it does take an “extreme” message to pull someone out of another, much more harmful extreme. Excellent article! And I love how timely it is. I recently spoke of the 80-20 rule in a workshop but almost felt uneasy about it because I HATE the idea of labeling foods as good or bad. Cheers to listening to our body and figuring out what our own normal and healthy diet looks like! Thanks for your support, Cora! I wasn’t sure about putting out a blog post criticizing a term that’s so commonly used among dietitians, so I’m grateful to hear that it is resonating. I really liked the point of this message. I have been struggling with my weight for years and have had a few dietitians work with me over that time. I have been very successful at losing weight but I have also been successful at gaining it back. I think I have the “good food, bad food” concept stuck in my brain. I think my dietitian does too. Although through psychiatric interventions I am feeling a lot better about myself, I really can’t seem to get my attitudes around food right. Maybe there is no wrong or right. And maybe that’s my problem. Thank you for your comment, and for sharing your incredible journey thus far. 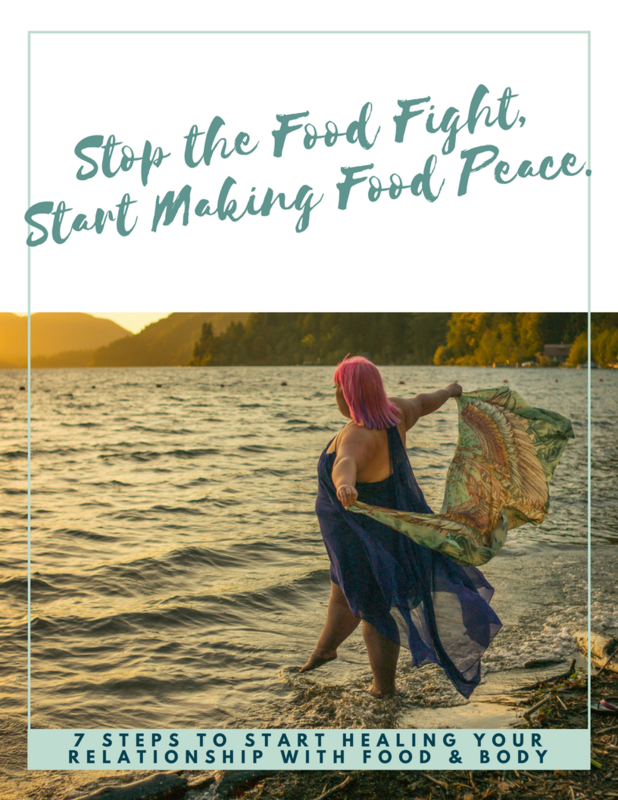 It definitely sounds like you’re at a turning point when it comes to healing your relationship with food. Please don’t think of it as a “problem” – it’s just all part of this amazing journey that you are on. These are such great points! I never realized how the 80/20 “rule” doesn’t work with intuitive eating. Love this new perspective you’ve given. Thanks for your kind words, Bracha!